A new record! It took an astonishing 4 minutes and 24 seconds to fill the 340 boat entry list for this year’s race. 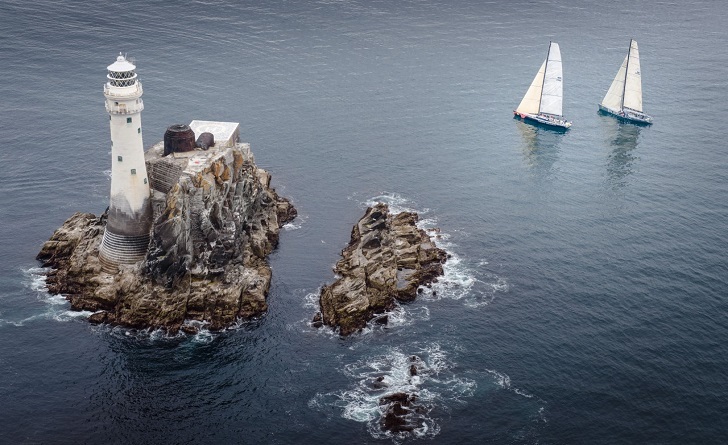 The race starts on Sunday the 6th of August, racing 600 miles offshore from Cowes to Plymouth via the iconic Fastnet Rock off the Southern tip of Ireland. Incredibly the 340 boat limit for IRC divisions was reached in record time, and over 200 entries filed online within the 1st minute minute alone. With 8 Volvo 65s racing as part of their mandatory preparation for the Volvo Ocean Race, and capacity for up to 40 Class 40s, the line up to this year’s event will make impressive viewing. Other entries include Vendée Globe runner-up Alex Thomson aboard his open 60 Hugo Boss, maxi yacht Rambler 88 and the radical 90 foot all carbon fibre CQS. Also, new for this year are higher upper limits for the length and height of the boats. This allows larger, more powerful yachts to enter the race such as the 115ft Baltic Custom Superyacht NIKATA (see image). There is also a steadily growing double-handed division, while nearly a dozen Sigma 38s will take on the race. The 47th edition of the Rolex Fastnet Race is organised by the Royal Ocean Racing Club. If you want to see the race start from Cowes, then get in touch for skippered Rib charter options. We’ll get you up close to the start line and follow the yachts as they race West out of The Solent into the English Channel as they head for the rock. Get on the water to watch the race start at 1200hrs on Sunday 6th August 2017. Call on 01590 674900 or email admin@solent-events.co.uk for more information.